Welcome back to another day of awesome binding techniques! As I mentioned yesterday, I like to sew my bindings on completely by sewing machine. It’s faster, the quilts are sturdier and I can finish more projects! This week, I’m using the Husqvarna Viking Epic 980Q to help with my bindings and to show you some super fun, fast and easy ways to finish off those quilts. Yesterday I went through the process of how to calculate the yardage and the number of strips required for regular crosswise (selvage to selvage) binding. Today, I’ll do the same thing but with bias binding. What is bias binding and why would you use it? 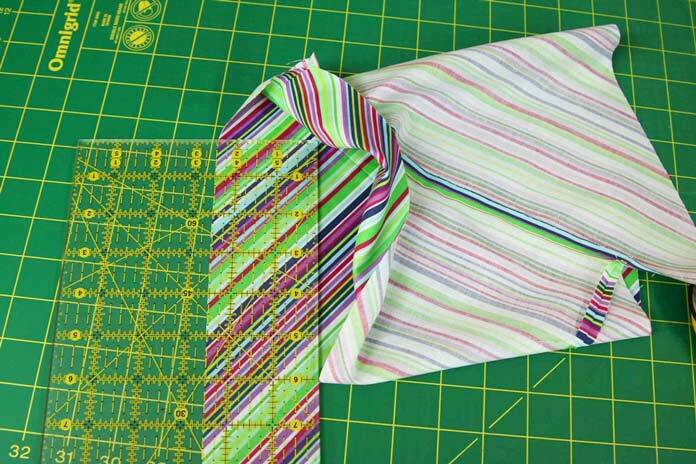 Bias binding is made by cutting your strips on the bias as opposed to cutting the strips crosswise from the fabric. There are two main reasons why you would use bias binding. 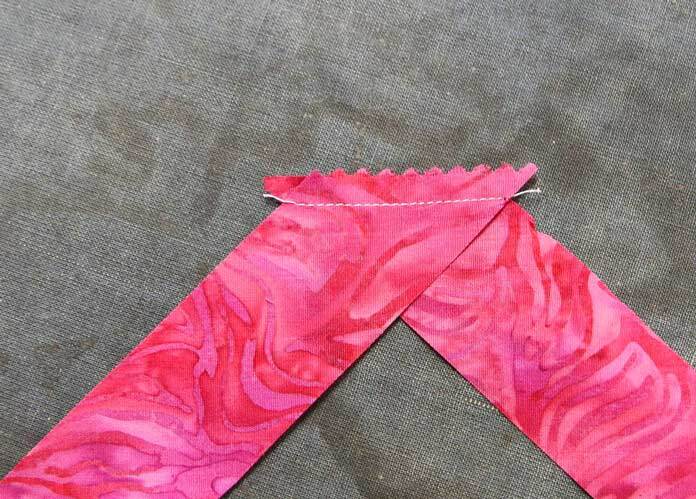 The most important situation where you would use bias binding is if you’re working with a quilt that has curved edges, you MUST use bias binding. The extra stretch in the bias binding helps to get your binding applied smoothly around the curves. 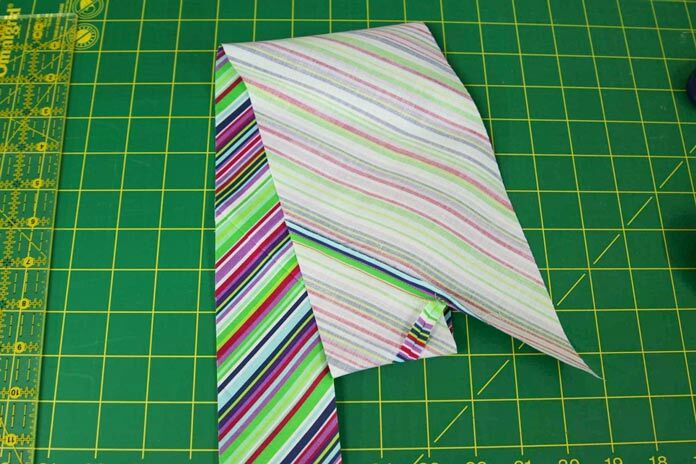 The other reason you may want to use bias binding is if you’re using a striped fabric and you want the strips to run diagonally on the binding. 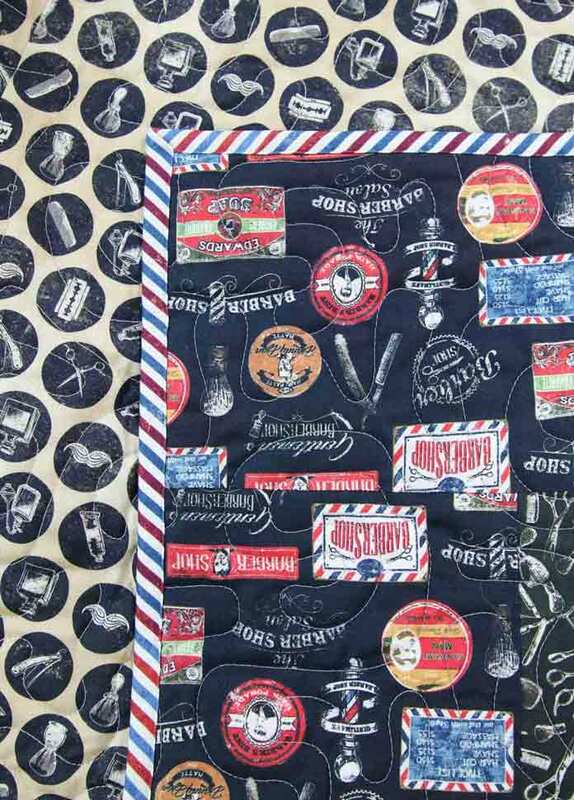 A striped bias binding on a quilt adds a lot of whimsy and fun to the finished project. 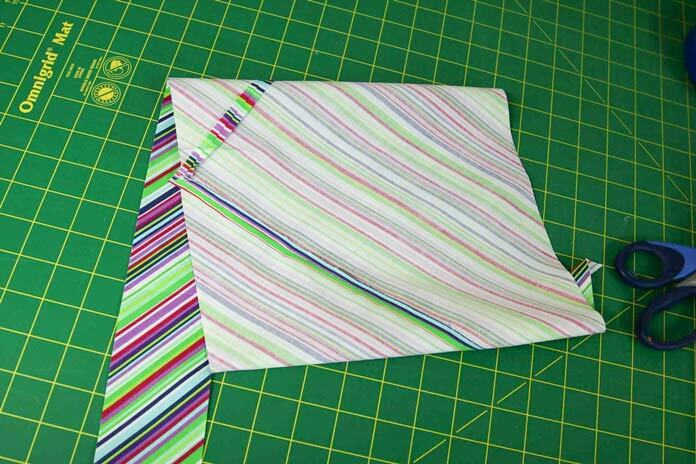 Of course, you could take the easy way out with those diagonally striped bindings by using fabrics like the one below. 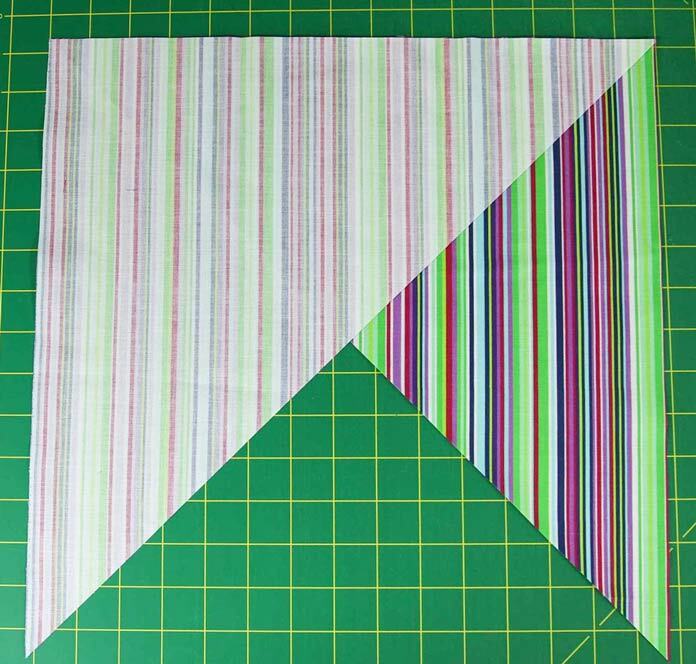 It’s a stripe, but the stripe was printed on the diagonal so when you make binding with crosswise strips, it looks like you’ve made it with bias binding. A cool effect. There have been discussions about bias binding being more durable than crosswise binding. I’m not sure that’s the case. I don’t have positive proof so I’m going to leave that discussion alone. But something to consider for future experiments. 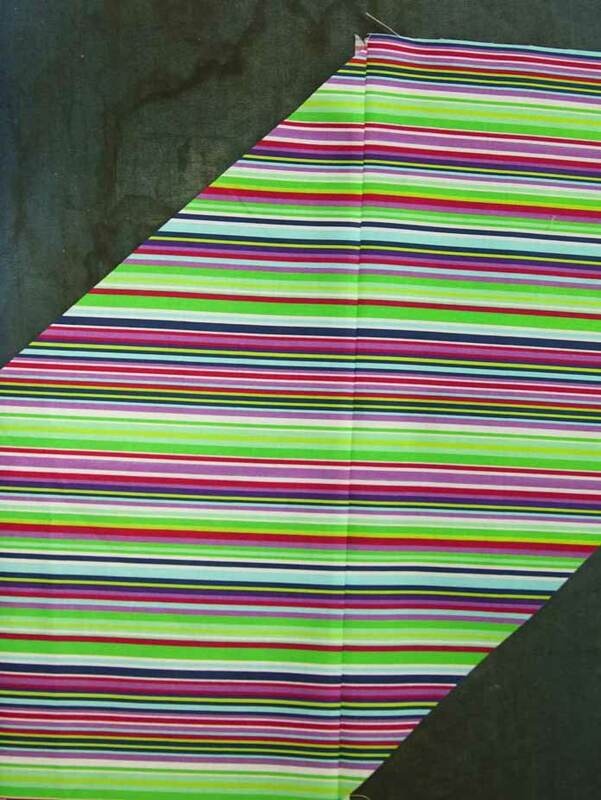 Here’s a quilt where I used the diagonally printed stripe for the binding. 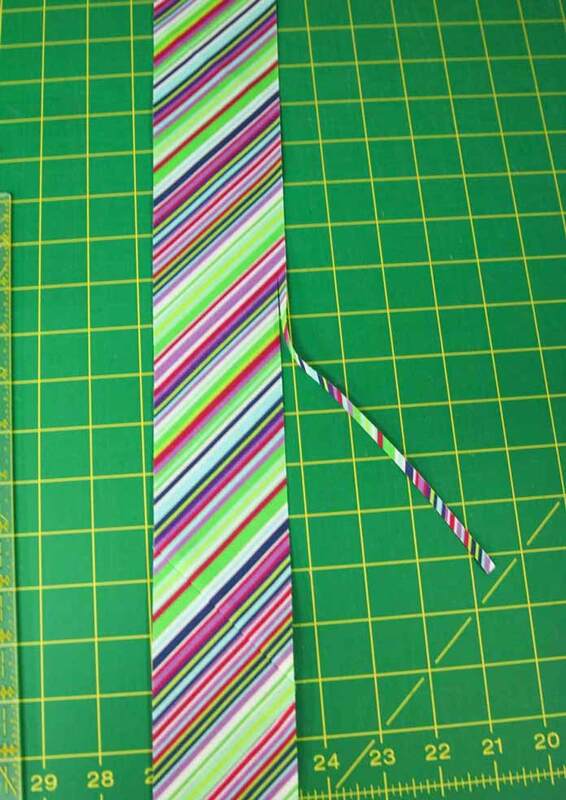 I simply cut crosswise strips and got a beautiful diagonal stripe in the binding. 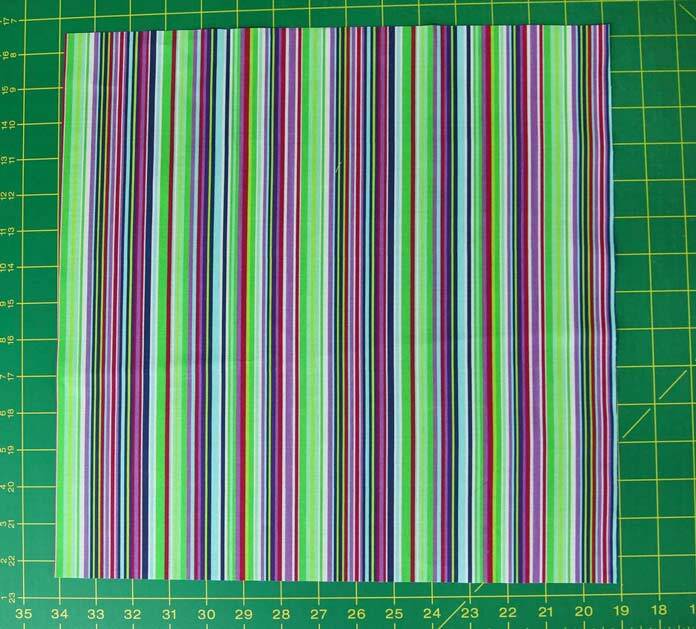 Cut bias strips (more on that at the end of this post). 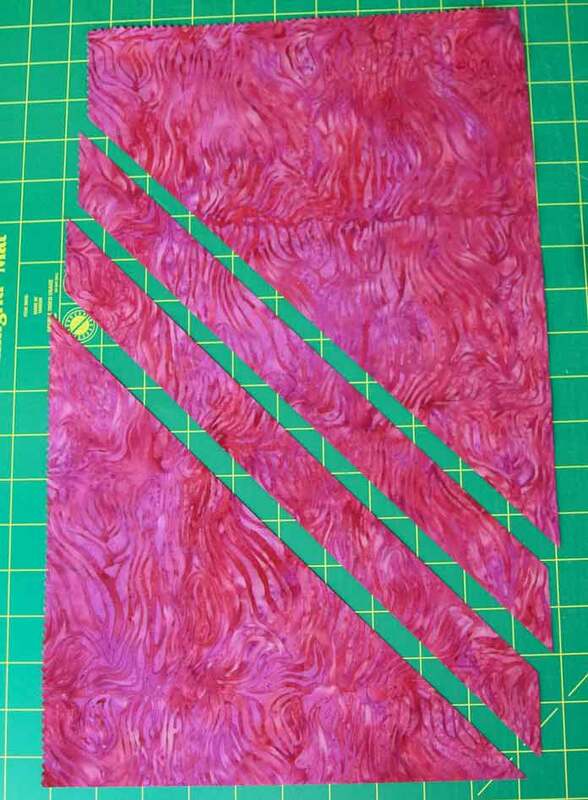 Make continuous bias binding by starting with a square of fabric. While either method provides the same result, I think the more efficient way is to start with a square. Find the area of the binding. WAIT – it’s not that hard. Just multiply 274 by the width of the binding strips. Remember I like to use 2½” wide strips. I need 685 square inches of fabric to make the binding. All that’s left is to get the square root of the area in order to know what size of square to cut. DON’T PANIC – this last step is easy. If you have a calculator with the square root function. it’s easy to plug in 685 and hit the square root function. If you don’t have a calculator, then you can download an app on your Smart Phone with the square root function. Alternatively, there are many square root charts online that you could use. In this case, the square root of 685 is 26.17″. Round the number UP to the nearest inch. In this case, I’m going to cut a 27″ square. The square needs to be cut in half once on the diagonal. Since the square is so large, I find it easier to fold the square in half on the diagonal, making sure the corners are well lined up. Then using a long ruler, place one of the lines on the ruler along the fold and the edge of the ruler at the tip of the points. Carefully cut along the edge of the ruler. Lay the pieces back down so they form a square. Take the bottom edge of the triangle on the left and flip it right sides together on top of the triangle on the right. 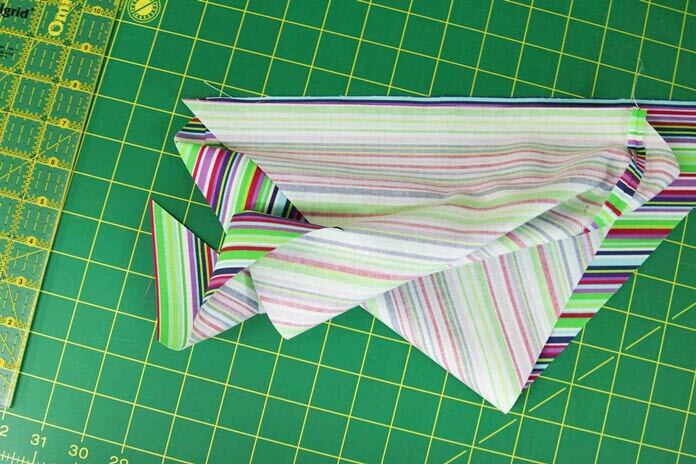 You can match up the stripes along the top edge for a more visually appealing join. 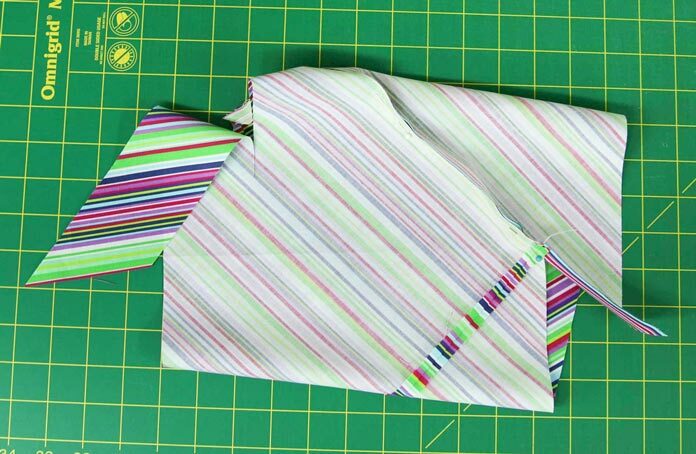 Using a ¼” seam allowance, stitch the two pieces of fabric together. 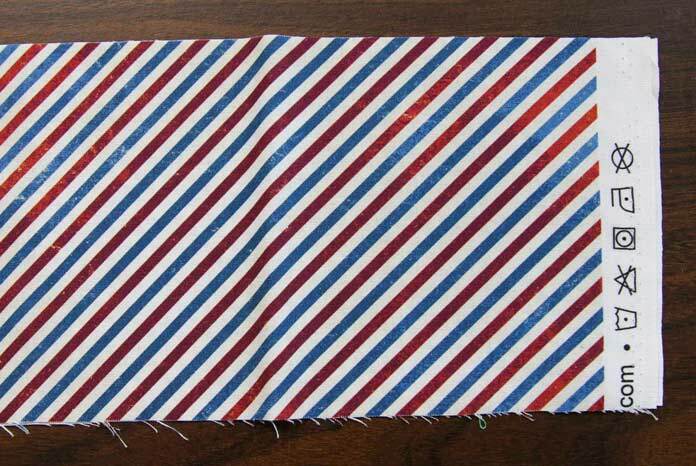 I pin this seam so that the stripes stay lined up. The stripes are almost perfectly matched. It’s close enough for me. Once this join gets translated into a skinny strip in the binding, any small mismatches won’t be noticeable. Of course, if you take more time and pin more frequently, it is possible to get a perfect match. The shape now has two bias edges and two straight edges. 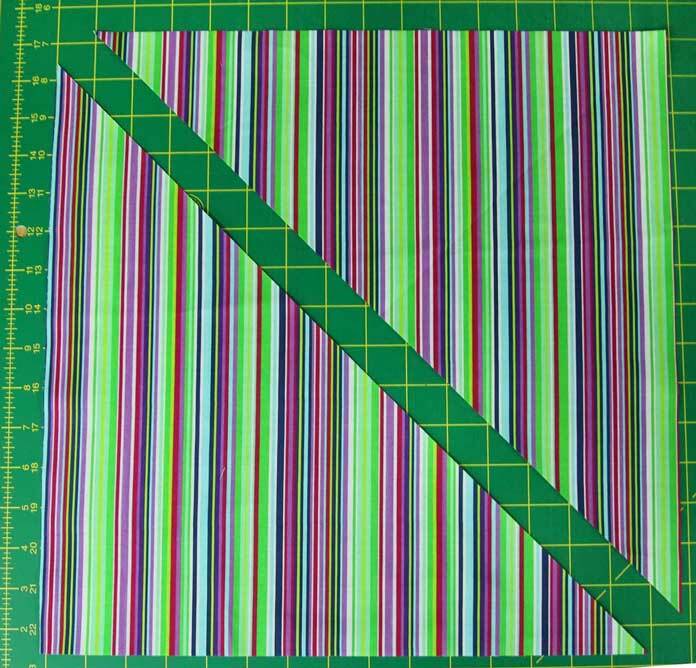 Place your ruler along the bias edge preparing to make a six-inch long cut that’s PARALLEL to one of the bias edges. The width of the strip will be whatever the width of your binding is. In my case, that 2½”. If you’re not sure which edge is the bias and sometimes, it’s hard to tell especially if you’re not using striped fabric, you can give the edge a little tug – if it pulls a lot, that’s likely the bias edge. This step is a wee bit tricky and looks almost impossible, but it works. You want to take the two STRAIGHT (non-bias edges) edges of the shape and join them. In this example, it’s the two edges where the stripe is running parallel to the edge. One of the straight edges is shorter than the other as it was made shorter when the 6″ cut was made. That’s because we want to create an offset tube. If we created a straight tube, we would be cutting bands, not a continuous strip. So, starting with the edge where the cut was made, line up those two straight edges and pin. There will be fabric “leftover” at the other end of the seam. Here’s a better picture of what the offset tube looks like. In the example below, the seam is pinned. Notice how the seams curve around the tube like a spiral. It’s a very awkward seam to pin, but once you get the hang of it, it works like a charm. Sew the second seam using a ¼” seam allowance and press the seam open. 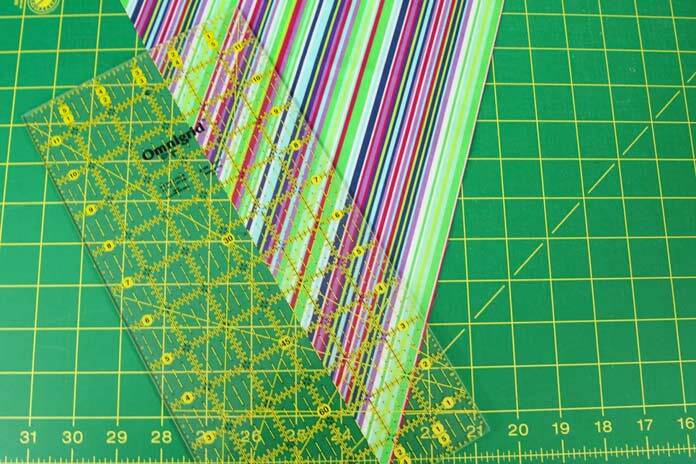 Using the rotary cutter and a ruler, it’s time to continue cutting on that 6″ cut that was made in Step Five. Be careful to not cut the other parts of the fabric tube. This can be a bit tricky when you start with a small square. Some people like to mark lines on the wrong side of the fabric and use scissors, but I hate marking so if I can get away without marking I go for it. Just go slow and you’ll be fine. Keep rotating the tube around and around as you cut. 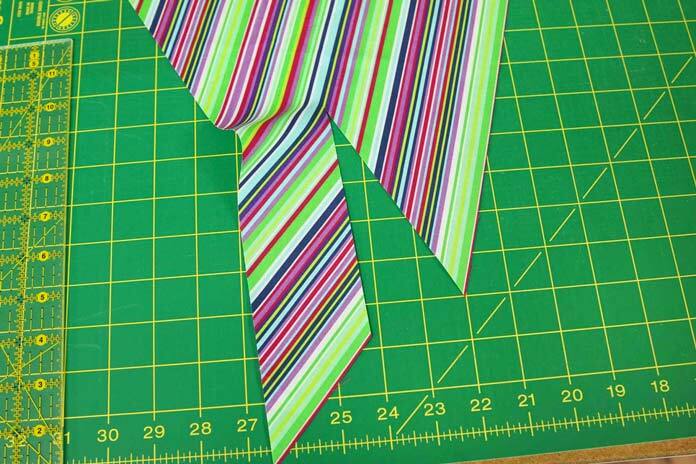 Remember the width of the strip that you’re cutting is the width of your binding. In my case, that’s 2½”. Unless we spent more time calculating the exact size of square required to have the math work out perfectly, there’s always some leftover. Just cut as much as you can that is 2½” wide and discard the remainder. Fold the binding in half with wrong sides together and press. Bundle the binding onto some form or shape or use the figure 8 method that was described in yesterday’s post. 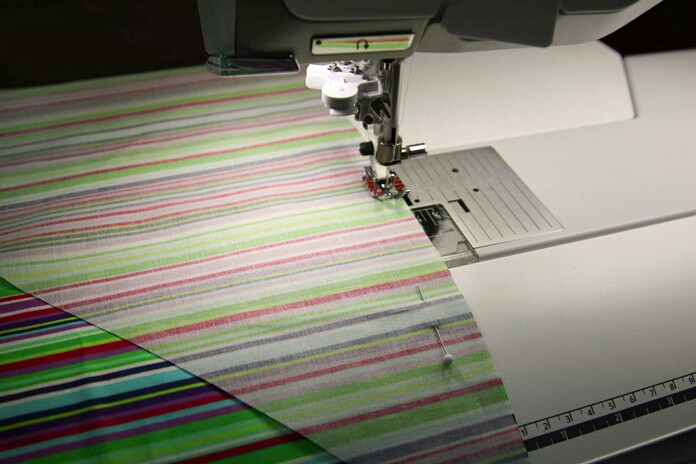 If you did not want to make the continuous bias binding, then you would take a piece of fabric and cut strips that are 45° to the straight of grain. How many strips? Well, I’m not sure and I’m not sure there is an easy way to figure it out which is why I prefer the continuous bias binding method. If you took a rectangle of fabric and cut the first bias strip so you knew how long it was, then you could calculate the length of binding required, divide that number by the length of the bias strip and then determine how many strips you need to cut. 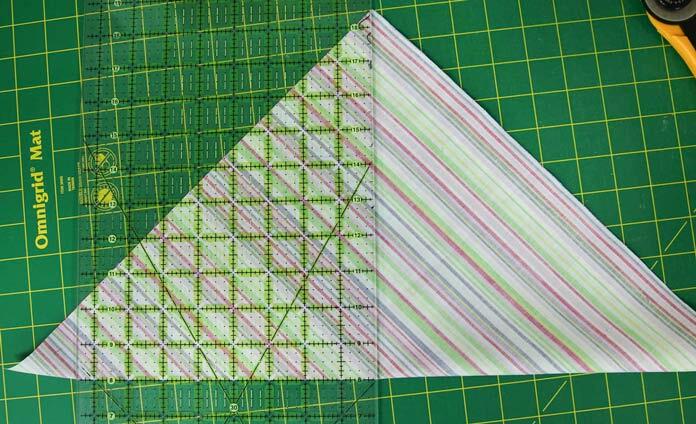 Then you will have those two triangles on either end of the rectangle that you can put in your scrap bin. This method takes more fabric than using the square. Once the bias strips are cut, you have to join all the pieces individually, being careful to line up those edges properly so you end up with a straight strip. I guess what I’m saying is that I like the first method. Seems to be less waste of fabric, more accurate, less calculating and faster. However, either will work. Now it’s your turn. Get out some fabric and cut continuous bias binding! Again, this was an easy task as I used the Husqvarna Viking Epic 980Q to join all the seams. 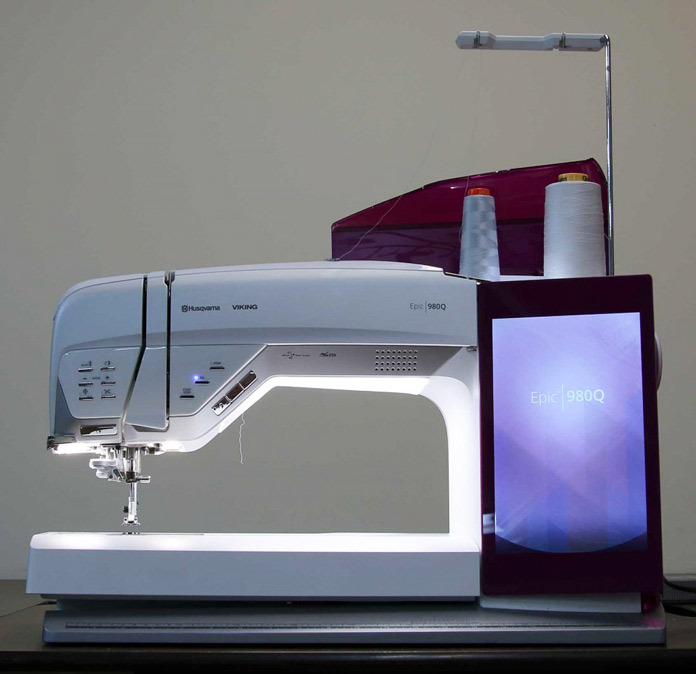 Tomorrow, we’re going to put the Epic 980Q to the test as we learn how to attach the binding to the quilt. For those of you who are not interested in attaching the entire binding by machine, make sure you come back tomorrow as the techniques used so far and those for tomorrow will be the same whether you are hand stitching or machine stitching that binding in place. Thanks so much for the wonderful explanation on how to do this. I have tried doing this several times but your directions make it crystal clear! This is so helpful, I have always struggled to make continuous bias binding, and this explains it in detail. I am encouraged to give it another try. Thank you. Thank you for all of the information on making bias binding. I have always wondered how to make it and how to calculate how large of a piece of fabric would be needed. Thank you for the tutorial on continuous bias binding. This is like magic! Thanks for this, ftom someone who hates to “pick up a needle” but LOVES to sew. I have a small, IMHO previously worthless, self-healing mat that I use on my ironing board with my rotary cutter when cutting bias strips. It works great!